The Hawaii Forest Industry Association (HFIA) has announced 110 people attended the “Growing Koa in Hawaii Nei” symposium Nov. 16 at Kilauea Military Camp (KMC) in Volcanos National Park. More than 40 of them participated in the tour of Keauhou Ranch, Ka’u the following day. The symposium brought together landowners, foresters, students and others interested in growing koa, for a day of panel discussions and presentations to promote sustainable forestry practices and to share the latest research on koa reforestation in Hawaii. “We are very pleased with the interest shown in Hawaii’s koa industry by business owners, forestry professionals, students and other participants,” said Heather Simmons, HFIA Executive Director. “Attendance exceeded our expectations. We are encouraged by their commitment to protect, preserve and grow Hawaii’s most popular indigenous hardwood and one of the most valuable timbers in the world,” Simmons stated. * An opening cultural protocol, “Koa moolelo,” by Cheyenne Hiapo Perry, Mauna Kea Watershed Alliance Coordinator. * Keynote speech by Dr. Charles Michler, Director of the Hardwood Tree Improvement and Regeneration Center (HTIRC) at Purdue University, Indiana and the Tropical HTIRC in Hawaii. His compelling presentation addressed ways to take advantage of genetic variation that exists within koa trees for a desired suite of traits and discussed research being conducted in Hawaii. * A koa mapping exercise and a preliminary report of the “Distribution of Koa Growers Survey,” by Julie Gaertner, graduate student in the Tropical Conservation Biology and Environmental Science program at University of Hawaii Hilo. * “2020: A Clear Vision” group goal setting plan for koa forests in the year 2020, facilitated by Mike Robinson, Department of Hawaiian Home Lands (DHHL) Property Development Agent and HFIA Director, assisted by Peter Simmons, HFIA Director and former Regional Land Asset Manager for Kamehameha Schools. The Keauhou Ranch tour included visits to a 3- to 6-year-old koa plantation and to various koa stands where trials are being conducted by Kamehameha Schools on koa stand thinning. 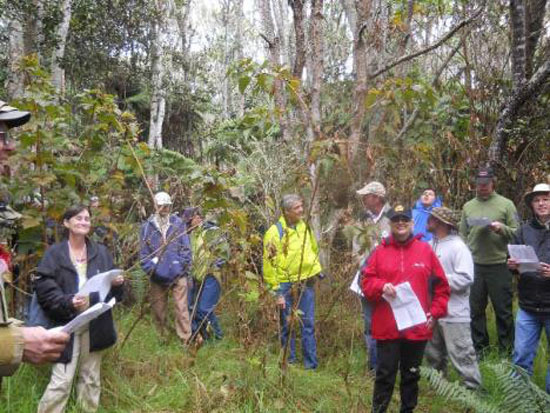 Led by Kamehameha Schools’ Land Asset Manager and forester Kama Dancil, Forest Solutions foresters Thomas Baribault, Ph.D. and Nicolas Koch, and University of Hawaii’s forester J.B. Friday, Ph.D., the tour provided an excellent example of large-scale koa forest restoration. Symposium sponsors included the County of Hawaii Department of Research & Development, Tropical Hardwood Tree Improvement and Regeneration Center, Department of Land and Natural Resources (DLNR) Division of Forestry & Wildlife (DOFAW), Awapuhi Farms & Mill, Hawaii Forest & Trail, and DHHL.